Farmville – 7-Eleven is being a tease! 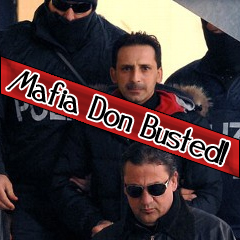 According to ABC News, Pasquale Manfredi, one of Italy’s top 100 most wanted men, used Facebook so often that his hideout was discovered from internet traces. He used Facebook to socialize as well as keep in touch with his fellow no-good-niks. I wonder if he played Mafia Wars? He allegedly had a number of killings under his belt as well as �illegally trading military weapons. That sort of thing makes us MW facegamers look like pikers. There’s the real deal right there. I’m torn between giving two pieces of advice here. So here’s both. 1) If you’re going to be a criminal, don’t use a public social site that police have access to. Duh. And 2) If you’re going to be a criminal, please use a social site to keep in touch with your cronies, so that it makes it easier for law enforcement to find you. Click here for the full article from ABC News. If you liked this article, please [fb-share] it with your Facebook friends!